Following the abdication of Diocletian in 304 AD, the political stablility began to gradually disintegrate taking with it the silver coinage. The argentius began to decline in size, weight and silver content. However, we also see the introduction of a half-argentius between 306-307 AD again illustrating a rise in inflation causing the bronze coinage to decline in size and weight while the silver coinage gradually disappeared. Eventually, civil war emerged within the Tetrarchy and the victor was none other than Constantine I The Great. The monetary system of the Roman Empire underwent a considerable number of changes during the reign of Constantine. While he was still only a junior partner holding the rank of Caesar, Constantine reduced the weight of the follis at the mints then under his control (London, Lugdunum and Treveri) and again reduced it soon after his elevation to the rank of Augustus (March, 307 AD). The final reduction to c. 68 grains was made some months later. This was only keeping in line with the reductions of the bronze follis being made by the other rulers of the Empire, but about 310 AD Constantine made some important changes on his own initiative. In place of the gold aureus (1/60th lb 5.45 grams), Constantine introduced a new coin called the solidus, which was struck at 72 to the lb (4.54 grams). Other gold denominations introduced were the semis (½ solidus 2.27 grams) and the 1 ½ scripulum (3/8ths solidus 1.70 grams). The aureuscontinued to be struck in the East until the defeat of Licinins in 324 AD when the solidus became the standard gold coin of the entire Roman Empire. Theaureus, however, was still occasionally struck up to about the end of the 4th century. During the later part of in his reign, Constantine resumed the issue of silver coins, which appears to have almost ceased after the large output under the Tetrarchy. This significant increase in the output of silver coinage came from a network of eight mints throughout the Eastern and Western provinces of the empire. In 325 AD, even the portrait of Constantine took on a stark new design depicting the emperor with an upward looking gaze without an obverse legend. This new portrait style is certainly suggestive of a divine awareness, and may well be a direct allusion to Christianity itself. This new style appeared during the year in which the celebrated Nicaean Council was summoned, resulting in the formulation of the Nicene Creed. 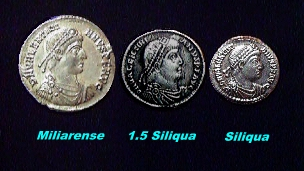 1 AU solidus = 2 semisses = 18 AR miliarensia = 24 AR siliquae. As in the case of the 1 ½ scripulum, there is also a silver denomination which appears to stand in no convenient relationship to the other denominations. This piece is slightly heavier than the miliarense (1/60 lb.) and is usually referred to as a “heavy” miliarense. Soon after the defeat of Maximinus II in 313 AD, Constantine and Licinius reduced the bronze follis to c. 18-20 mm in diameter and 48 grains in weight. Thereafter the denomination is usually referred to as an AE 3. This module was then reduced further to 17 mm and 30 grains around 330 AD. A few years later, possibly in 336 AD, there was still a further reduction in weight to 20-25 grains. 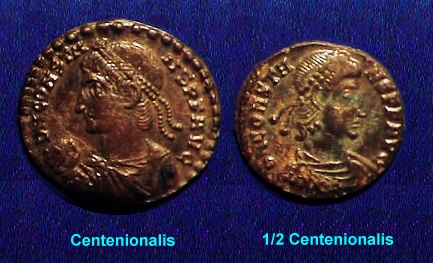 These bronze coins of the last 7 years of Constantine’s reign occasionally decline to AE 4 module (under 17 mm.) especially after the weight reduction in 336 AD. The inflationary pressures continued to rage onward without any sign of subsiding. This trend became most noticable in the bronze coinage. During most previous monetary reforms, the state tried to overvalue the bronze coinage thus driving silver from circulation as well as gold (Gresham’s Law). However, the monetary reform of Constantine worked in the opposite way at first. The bronze coinage continued to decline in weight and size and must have also decline in value relative to both silver and gold. Considering the fact that the follis of Diocletian began with a weight of 12.5 grams+ and a diameter of 30mm, we can see that within 24 years, the follis declined in weight by 75%. While there seems to have been a brief period of some stability between 323 and 335 AD, the death of Constantine I The Great in 337 AD appears to be followed by another sharp decline to the point that the follis became a mere token currency with a diameter of 15mm and a weight of less than 2 grams. This deporable decline for the follis meant that the overall reduction was effectively 90% in weight and a 50% in diameter over a 50 year period from its first appearance under Diocletian. 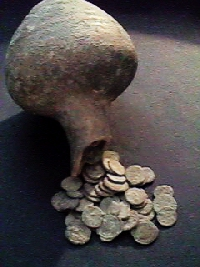 Nonetheless, hoard evidence, as pictured above, demonstrates how prevalent this reduced follis became during the 4th century. The inflationary pressures upon the Empire subsided to some extent for about 4 years and then began to rise gradually once again. In 348 AD, the inflationary pressures forced yet another monetary reform during the joint reign of Constans and his brother Constantius II. The first coinage to be reformed was that of the bronze. A new bronze denomination was introduced known as the “centenionalis” thus marking another attempt at restoring weight (4.5 grams), size (23mm) and value within the basic coinage of Rome. As is the case with any major monetary system reform, there are only two choices with regard to the current outstanding money supply. Either such issues are recalled and exchanged for the new denomination at a sharp devaluation (see Germany 20th century and birth of US dollar) or the old currency is simply demonetized. In most cases prior to the invention of paper currency, the outstanding money supply still had to be revalued in terms of the new denomination. It was nearly impossible for the state to mint a sufficient supply of new coinage to replace the entire money supply of decades. Exactly what happened to the drastically reduced follis (17-15mm) is the question at hand. We do know that the small reduced follis was simply discontinued while a “half-centenionalis” denomination was struck at this time with a weight of 2.25 grams. At first glance, one might consider that the reduced follis could have been valued at “half-centenionalis”. However, since the majority of the reduced follis in circulation at this time was on average 1.65 grams, it is unlikely that such a high value would have been given to the outstanding money supply. Such a high valuation would not have offered any reforms with an attempt at reducing inflation, but would have merely perpetuated the current trend. It is most likely that the the reduced follis coinage in circulation may have been valued at a “quarter-centenionalis” at best. It is possible that the reduced follis in circulation at that time may have been devalued to as little as a “1/10th centenionalis” based upon what has taken place throughout history on numerous occassions. Constantius II also began to issue a “heavy-centenionalis” with a weight of 6 grams between 350-354 AD. In this case, the size of the flan was about the same as that of the “centenionalis.” The major difference was the thickness of the plannchet. This suggests that the “heavy-centenionalis” of Constantius II was perhaps a “1 ½ centenionalis.” We do know that the “centenionalis” did begin to decline in weight often falling to between 3.25-3.6 grams. This “heavy-centenionalis” may represent simply the Eastern Roman Empire’s equivilent to the West’s “double-centenionalis.” Eventually, this bronze series of denominations based upon the “centenionalis” was discontinued by 354 AD and replaced by a reduced bronze denomination of about half the weight known today simply as the AE3 with a diameter of 18mm. Based upon the fact that silver coinage tends to become scarcer during this period in time, the above mentioned system of gold to silver relationship makes sense. However, it is also possible that the silverreduced siliqua may have been the equivilent of 2/3 siliqua of pre-reform or 1/2 miliarense thus making it 1/36th of a gold solidus. What is clear, is that during the reign of Valentinian I (364-375 AD), we do find that a 1 ½ siliquadenomination was being struck in sufficent quantity. This denomination first appears in 363 AD introduced by the emperor Jovian (363-364 AD) and was last struck by Valentinian II (375-392 AD).